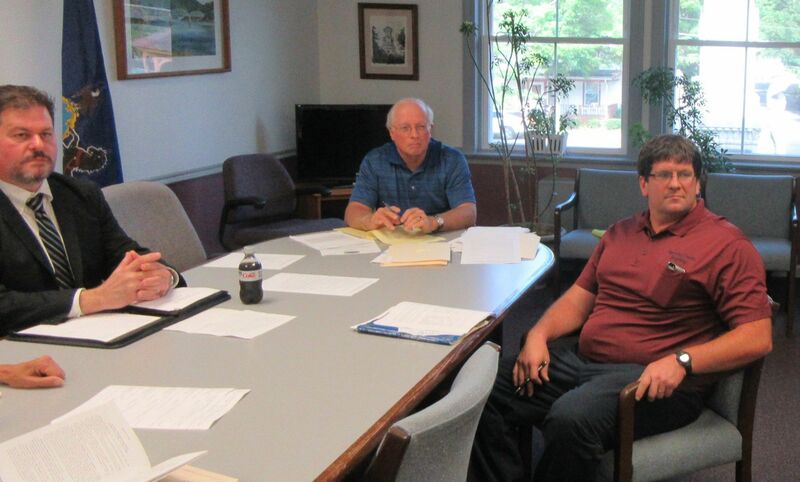 Wyoming County Recycling Coordinator Mike Rogers (seated above, right) met with county commissioners on Aug. 23 to provide details about upcoming electronic recycling. 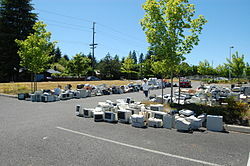 The cost to recycle old electronics like photo copiers, television sets, and computer monitors continues to climb because recyclables have declined so much in value as a commodity – that according to Mike Rogers, Wyoming County’s Recycling Coordinator. While the county cannot offer free (or nearly free) recycling as it once did, a number of common items can still be dropped of the recycling center at 130 Tunkhannock Township Drive on Saturday, Sept. 17 at no cost. They include answering machines, lead acid batteries, cell phones and pagers, desk top copiers, CPUs, fax machines, keyboards, laptops and desktops, microwaves, modems, printers, radios and stereo systems, and VCRs. Rogers presented a new price list to the commissioners for many other kinds of electronics. The fees collected will hopefully cover the cost of the program, which the county conducts through Responsible Recycling Services. Television sets over 42 inches top the list at $50 each, with all other television sets at $35 each. Additional prices are as follows: refrigerators and floor freezers $30; air conditioners $25; standing floor-model photo copiers, stoves, dishwashers, clothes washers and dryers $20; CRT (tube) monitors $12; and LCD (flat) monitors $8. Electronics will be accepted from Wyoming County residents and small businesses only from 9 am to 1 pm on Sept. 17. Televisions have to be whole. Cash or checks accepted only. Checks should be made payable to Responsible Recycling Services.